Women are getting proactive about their health needs and rights. The financial downturn has made it crystal clear that women’s economic status is intertwined with the health care equation. 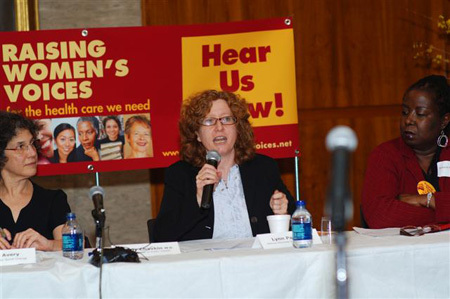 On April 1st and 2nd in New York City, a National Women’s Speakout for Action on Health Reform, combined with a Strategy Conference, was held. Sponsored by Raising Women’s Voices, the first day dealt with how to amplify women’s concerns and integrate their opinions into the health care discussion, building from the grassroots level up. A workshop was devoted to developing the appropriate skills for eliciting personal stories from women, which could be introduced into the larger conversation. The strategies of new media and social networking were referenced as tools that could exponentially expand the efforts to influence public policy. Dr. Nancy Snyderman, NBC News Medical Editor, moderated a two-hour speak- out for action. The focus was to bring the modalities learned for organizational outreach back to the community. Day two featured a host of top speakers sharing their insights on how to jumpstart reform in a way that puts women’s interests squarely in the middle of the health care landscape. Individual presenters parsed varying agendas, with each pointing out inequities in the existing formula. Jennifer Ng’andu, Associate Director of NCLR, the largest national Hispanic civil rights/advocacy organization in the country, addressed the need for revisions that would help the Hispanic community. The evidence of marginalization is in the numbers. Hispanics have the highest rate of being uninsured. The Senior Advisor for Health and Reproductive Rights at the National Women’s Law Center, Lisa Codispoti, underscored how “wedge issues” such as abortion, family planning, and immigration rights could be used to divide health reform advocates. She entreated the audience to ensure that diverse groups work together. Codispoti pointed out that women face affordability issues more than men. In the individually purchased insurance plans, women pay more than men for coverage in forty states (“gender-rating”). Only 12 per cent of these non-employer based insurance plans offer comprehensive maternity coverage. Codispoti also called for an acknowledgment of the challenges facing women with disabilities, and the need for accessibility to programs for mental health and drug/alcohol treatment programs. The United States is paying more for health care and getting less. In a distributed handout on why the country needs to pass H.R. 676, a graph showed how America stacked up against France, Sweden, Italy and Finland. It wasn’t encouraging. All four nations have Universal Healthcare and paid parental leave. It was noted that other industrialized nations have either free or subsidized childcare and eldercare. However, participants stressed the belief that change was possible, particularly with “a new President and Congress committed to health reform.” But it cannot be left up to the lawmakers and established alliances to do all the work. Each woman must be vocal about her needs, and join with others to move the dialogue forward. Our Bodies Ourselves – Excerpts from the Our Bodies, Ourselves books. Information on a Range of Women’s Health Topics.